F or nearly half a century, Dr. Irwin E. Thompson spent his days in laboratories and operating rooms, helping people start families through in vitro fertilization. Now retired from medicine, he continues to study life, birth, and nature - through art. "Painting and writing poetry has become a natural way for me to celebrate pivotal moments in my life and express my deepest feelings through words, color, form, and texture," said Thompson, 70. His first book, "Memories and Milestones: Poems and Paintings," which was published last year, touches on experiences ranging from the death of his best friend at the age of 10 to surviving prostate cancer. The Newton resident will read from his book and discuss his art at 3 p.m. Jan. 27 at the Danforth Museum of Art in Framingham. Thompson paints on large canvases, using both acrylics and oils. For the book, the paintings have been reproduced with an accompanying poem, creating double-page spreads. He frequently incorporates collage and elements of nature, such as petals and Sumi ink drawings done on Himalayan bark. Bold colors complement one another in works like "Barrier Reef." In "Correspondence," thick layers of paint surround part of a handwritten letter. The parallel works reflect the 50 years of letter-writing between Thompson and his 99-year-old mother, who lives in Scotland. The poem's chilling and poignant words illustrate a visit Thompson made for his mother's 95th birthday. When he arrived she was in the midst of having a stroke. One of the earliest events covered in Thompson's book is a class trip from his hometown of Glasgow to Switzerland at the age of 10. Thompson was swimming with his best friend in Lake Geneva and decided to head back to the beach. "Ten minutes later someone asked where George was," recalled Thompson. "I told them that he was in the water. When there was no sign of him, we told the teacher. George had drowned; his body was found four days later." 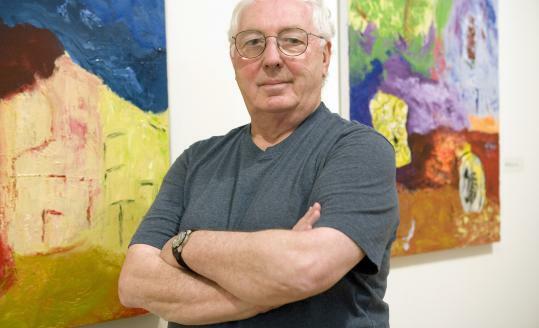 Thompson's paintings have been exhibited at the Nielsen Gallery in Boston and the Perrin Gallery in Brookline. Some works are on display at the Discovering What's Next HUB at the Newton Free Library (third floor) as part of a collaboration between the New Art Center and Discovering What's Next, whose mission is to engage midlife and older adults in creative exploration. Thompson laughed when he said that his impetus for the book was a growing self-awareness that he was beginning to forget things, "which is very normal for my age." Fellow artist and poet Susan Bazett, a native of England who also lives in Newton, has known Thompson for a number of years. "He's a funny character," said Bazett. "He's always up - whether he makes a sale or not - and plugs away." Thompson loved art as a child, but his family's modest income meant spare time was spent working toward the grants that would get him through college and medical school. "I was taking a scholarship examination with hundreds of young men when I was 10 years of age," Thompson recalled. "It sounds crazy, but I didn't have time to draw." Thompson came to the United States in 1961 for a residency at the University of Tennessee in Chattanooga. After a fellowship in Seattle, he went to Stockholm as a National Institutes of Health fellow and worked toward his doctorate. "I was drafted into the US Army as a noncitizen living in Sweden because I had a green card," said Thompson. He was sent to Landstuhl, Germany, and soon became vice chairman of obstetrics and gynecology. "After three months I was promoted to lieutenant colonel of the US Army - and I was an alien!" Promotions were based on when one enters medical school, which he began at 17. During the time Thompson spent in Stockholm, he connected with Melvin Taymor from Harvard University, who urged him to come to Boston and work at the then-Peter Bent Brigham Hospital, the antecedent of Brigham and Women's Hospital. Six months before Thompson was to be discharged from the military, he received a letter from Taymor saying that he was still holding a position for him. Thompson has served as an assistant professor at Harvard Medical School, and a staff physician at the Boston Hospital for Women and Beth Israel Hospital. Thompson was also director of the gynecologic-endocrine laboratory at Beth Israel, where he did extensive research on mouse eggs, growth, and human sperm. It was at Beth Israel that Thompson met his three future partners; they quickly found that working on staff at a major teaching hospital meant that their egg extractions (which require precise timing) were put at the bottom of the critical list compared with implanting a new heart, emergency cardiac surgery, and severe trauma. So in 1986, they started Boston IVF, which began in Brookline before moving to its home in Waltham. Thompson recalled one case in which a married couple came to him for help. The husband had been injured in an automobile accident and was a paraplegic with a severely low sperm count. Their attempt at in vitro fertilization was a success, and a few years later the couple returned to have a second child. About 20 years ago, while Thompson was putting in long hours at Boston IVF, he decided he didn't want to live and die not doing the art he knew was within him. So he created a studio in his home. "I used to come upstairs at 9 p.m. and draw, do some watercolors until 11, then go to sleep, as I had to be up at 5:45 in the morning," said Thompson. During vacations Thompson would take part in residential art courses at Bennington College in Vermont and continuing education courses at the Massachusetts College of Art and the New Art Center in Newton. At the end of 1999, Thompson retired from medicine, with a shoulder injury taking away his ability to perform surgeries and IVF procedures. As an artist, Thompson said that his goal has been to move away from science. "My whole life was spent seeking experimental proof for everything," said Thompson. "I don't believe that that is what art is about." To suggest a subject for a People profile, e-mail Lebovits@globe.com.